LIKE & SHARE TO WIN! 2 night stay in a luxurious loft or theme suite PLUS a one day wine tour package. 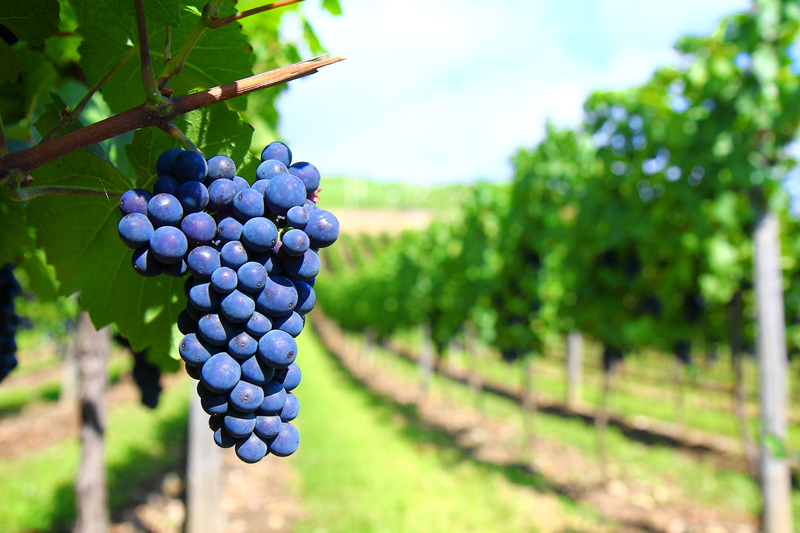 Tour includes a guided wine tour by a tour specialist, pickup and drop off at the Ramada Hotel, all venue fees, selection of wineries’ tastings of the day. The Ramada Kelowna Hotel is centrally situated in the heart of downtown so that you can enjoy numerous activities that cater to individuals, couples and families. Many people who have stayed at the Hotel have commented that the staff go above and beyond to make them feel welcome and comfortable. The Perkin’s Restaurant and Mickie’s Pub & Patio have also been treating their hotel patrons & guests with exceptional food & service. However, if you prefer, there are numerous restaurants nearby that cater to a wide range of tastes. Because we are located in the heart of wine country, there’s an endless supply of quality wineries surrounding Kelowna such as Ancient Hill Estate Winery, Arrowleaf Cellars & Beaumont Family Estate, to name a few. 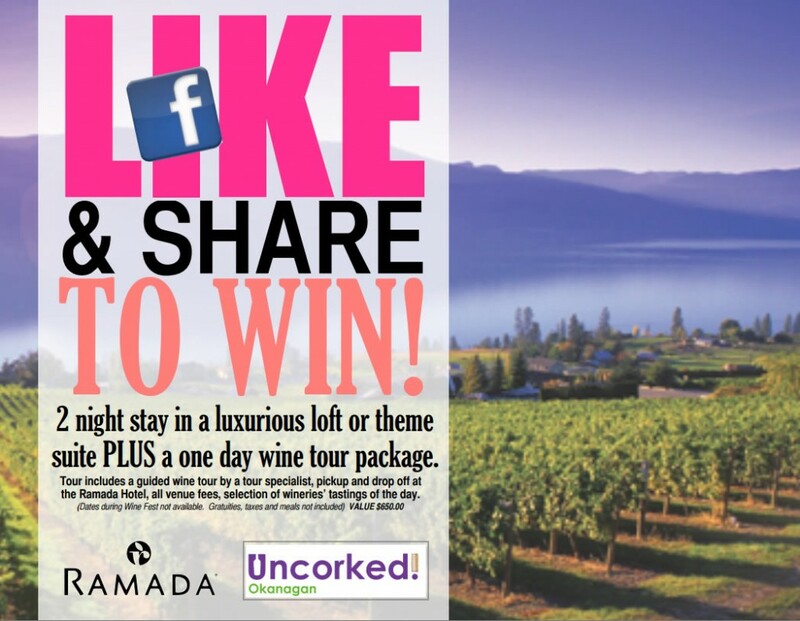 Wine tours are scheduled throughout the year and the staff at the Ramada Kelowna would be more than happy to help you arrange one during your stay. Whether alone or with friends and family, the Ramada Kelowna offers an exceptional experience that will keep you coming back year after year, offering memories that will last a lifetime. Visit our Facebook Page for A Chance to Win a VIP Ski Package To Big White! If you come visit our facebook page, like & share it for a chance to win a VIP Ski Package to one of the best Ski Resorts in British Columbia! Come and visit our facebook page, with just a simple click you could win a VIP ski package for 2 to one of the best ski resorts in British Columbia. Included in the package is 2 lift passes for Big White Ski Resort, 1 night accommodation in one of our loft or theme suites, and 2 appetizer coupons for Mickie’s Pub. Only a like & a share away from a chance to feel the cold air blowing in your face as the adrenaline rushes through you. Having some of the best of times with either friends or family is what Big White Ski Resort is all about and they love to keep their customers happy. In just 2012 alone Big White Ski Resort has won awards for being Best Park & Pipe in the Pacific Northwest, #3 on the list of Things to do in the Okanagan Valley by trip advisor, family ski resort of the year by snow action magazine in Australia, the Tommi Tyndall Award by far west service awards, and 2012 BC Alpine Event of the Year. The motto at Big White Ski Resort is “it’s the snow” and it most definitely is the snow at Big White Ski Resort. Over here at the Ramada Hotel and Conference Centre Kelowna we’re just an hour away from Big White Ski Resort and also are home to Mickie’s Pub. So stop by on your way home or on your way up to Big White Ski Resort for great food, drinks and accommodation. Exposure is the key to gaining knowledge, and there is no greater way to expose one’s self than to get into a car, train or airplane and travel to a different city or country. When you travel, you get to meet new people, learn their culture, see wondrous sites and experience festivals that you never would have imagined if you had stayed at home. Though it may take some planning, it can always be said that traveling, especially with kids, would be both time and money that would be well spent. Whether you’re looking for a romantic getaway, a hideaway that is close to nature, or a town where you can shop and try out new food, you will find it in Kelowna. Situated in the province of British Columbia, Kelowna has much to offer for every type of traveler, whether he or she is in search for adventure, or simply desiring a time to relax. Children never get tire of water, and this is the same reason why they will never be tire of Kelowna. With the number of beaches close to the city, the fun will never end. Building sand castles, burying each other or simply splashing in the waves would give the children fun memories and have them waking the next day yearning for more. Beaches don’t have to be the only natural wonder that children are exposed to. Grassy hills and wonderful views can also enthrall them, and these are numerous in Kelowna. Just minutes away from the city are hiking pathways that lead to picnic areas with breathtaking sceneries. Not much can be more relaxing than a meal on the grass while enjoying the passing cool and crisp breeze. Of course, no one should forget the wine. Kelowna is known for its vineyards and orchards, and the wine is excellent. Most of the festivals in this area revolve around this delicious liquid, and you are sure to take more than just a bottle home with you when you sample what this area has to offer. At the end of each day, you would of course need a great place to rest, and that would require an excellent downtown Kelowna hotel. Though once again, the town has a lot to offer its guests, a lot of people would still recommend the Ramada Hotel in Kelowna BC. Located at the heart of the Okanagan Valley, this hotel becomes the perfect place to stay whether in town for business or pleasure. With 135 rooms and suites, it is practically impossible to not find a room you would love. These rooms range from Deluxe rooms to two level loft suites and themed suites, perfect for bringing the entire family, and even hosting a small gathering within one of the rooms. And since the Kelowna Ramada Hotel and Conference Center is a pet friendly hotel, you can be sure to travel without leaving any member of the family behind. You definitely have no reason not to visit Kelowna. So if you find yourself with free time, get yourself (and perhaps your family) some downtown Kelowna fun this autumn. Book a room at the Ramada hotel in Kelowna, and create some memorable experiences for you and your loved ones.